Item Number: 310-4-51 18021 Actual Weight: 0.8 lb. An economical way to hold cold beverages. 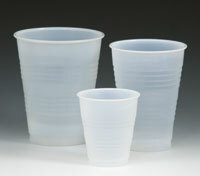 Plastic cups have rolled rim and sidewall ridges for added strength.